Phosphophyllite is the main protaganist and the youngest Gem. Phos’ hair is more like our Chronos wig which you can trim on the sides and slightly fix the bangs in the middle. If you want a longer version, Helen wig is the right fit just for you. The new Phosphophyllite’s transformation given new gold arms after losing it in the battle. You can check out our Apollo wig which you only need to center part it’s bangs and flatten the hair. Now that is a transformation! Who would thought that Phosphophyllite would reach another new version? To achieve this hair, we have Nyx Dark Blue that’s ready to wear and Nyx Cobalt Blue if you want a lighter version. Now this hair looks better! This is still Phosphophyllite! This short hair looks best when you have the Aether wig, chop the back to get that look. If you want a darker or longer version, Chronos is best for you. Diamond is assigned to do patrol duty, they have hair that gives them a high light dispersion that creates rainbow reflections. Chronos wig is the best wig to achieve this type of hair. Also Aura is a different version that we think is also perfect! You can use our wefts or die your hair with a rainbow pasterl color. Antarcticite is one of the gems that mainly does patrol duty, they have white color scheme with a hint of blue in their eyes and hair. Aether wig only need a few trim or Aphrodite to add depth. Cinnabar are on night patrol duty, they hate to fight and doesn’t want to be seen. Their hair colors are red which is more like our Theia and Helios, adjust it to a medium long asymmetrical hair and be ready for battle! Bort is obsessed with combat, they have black long hair that almost reaches the floor. Best wig we have is the Persephone plus add our weft and start the battle! These twins won’t break when they touch each other. Amethyst 84 and 33 both have purple braided hair styled to cover their eye. Theia or Apollo wig is easy to style, followed by the weft for the braids. Yellow Diamond is the fastest of the gems and has a yellow hair. What could get you this look? Our Theia and Helen wig of course, just a few trimming and styling then voila! This gem is one persistent doctor named Rutile. You can find them somehow sleeping in the corner with their medicine tools. They have two hair colors, reddish brown and golden yellow which is what we have in store for you! Check out our Phobe wig which is a few styles to get Rutile’s hairstyle, then spin it off with our weft extension! Red Beryl is a person of fashion and also a tailor. 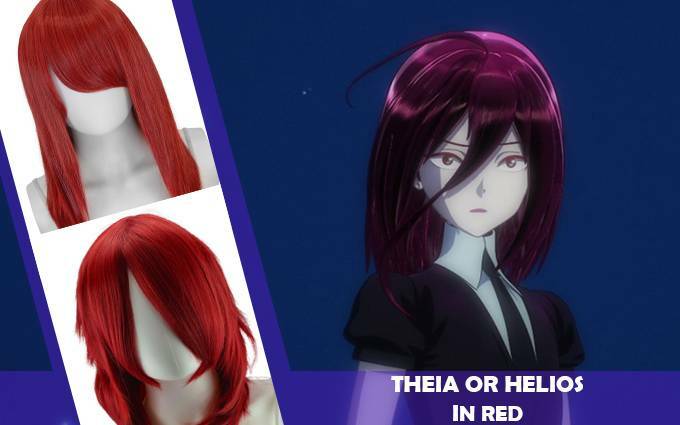 Get our Gaia wig and be as fashionable as Red Beryl so people can never argue on you about fashion. If you ran into problems then Benitoite can definitely help you because they can never say no. They have short hair and Aphrodite wig is the match for this hairstyle. Slightly trim the edges to achieve this look! One tough gem, this is Jade. They have a dark green hair color and a very serious person. This hairstyle is easy to find like our Nyx wig. Fix the bangs then tie gently tie the hair on the back. Paparadscha is born with an incomplete torso although this does not stop them from being easygoing and calm. They have long pink-red curly hair like our Hera wig and ready to wear!